Window blinds and shades come in a number of styles, so no matter which one you choose, you’ll always have a lot options. Understanding the difference between blinds and shades in Riverside, and the advantages of each will help make your decision much easier to make. Blinds are window treatments made out of a series of slats or panels. They can be made of wood, aluminum, vinyl, or a composite. These could be horizontal or vertical. Shades are typically made of fabrics, vinyl, or woven wood. They can be pulled up or rolled down, but the amount of light they let in cannot be adjusted otherwise. You can customize how opaque they are, as well as whether you get roller shades, motorized shades, woven wood shades, cellular shades, UV shades and more. 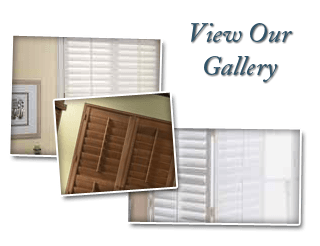 The experts and Anytime Blinds and Shutters, your local Riverside window blinds company, can help you decide on which window treatments would be best for any part of your home during a free consultation. When you’re deciding on which of these two are right for your Riverside area home, there are few things that you’ll need to consider, such as architectural details, interior design, and overall lighting. If you have big, bold architectural elements in your Riverside home like a bay window, for instance, you may want to use wood shutters or blinds, which can complement architecture that has a more classic feel. The clean, horizontal lines can accentuate the contemporary and sophisticated look of some interiors. You should also consider your room’s interior decoration style. You should try to create a balance with the interior design of the room and your window treatments. For instance, if your room has tile flooring and hardwood furniture, the softness of roman shades can help make the room feel comfortable. One of the most important things to consider when you’re deciding between window treatments is how they can affect your home’s energy efficiency. In the Riverside area, your main energy efficiency concern is keeping your home cool, and that’s certainly something that your window treatments can help out with. If you have windows that face west or south, they’ll receive a good amount of warm light, so it’s important to make sure that they’re able to provide extra protection. UV shades may be your best option in these parts of your home to keep your home cool. UV light damage can also fade or darken hardwood floors or furniture, and these shades will protect against that as well. Bedrooms and bathrooms need treatments that can provide full privacy. Rooms in which you’ll watch TV or work at a computer will need treatments that give you full control of the light that’s let in. If you use shades in either of these two parts of your Riverside home, you may have problems with both light control and privacy. Shades can have any opacity you like, so they can let any amount of light in when they’re closed, but you won’t have the same amount of control over the amount of light you let into your home or over privacy that you’d get with blinds. Our professionals offer free in-home consultations to help you decide on which window blinds or shades and which specific models from our selection would be best for your home. We also offer free installation with the purchase of our products. Call us today, and we’ll be looking forward to working with you to help you find the perfect blinds or shades in Riverside, CA for your home. 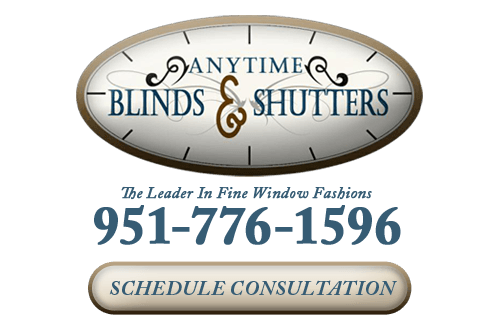 If you’re looking for a blinds or shades in Riverside, call Anytime Blinds & Shutters at 951-776-1596, or fill out our online request form.